(NaturalNews) After analyzing the Monsanto Collaborators website for the last day or so, I've come to the conclusion there is a very high likelihood this site has been launched by the biotech industry to serve as a trap for GMO skeptics. Since then, the Monsanto Collaborators website has started naming all sorts of journalists it describes as "Monsanto collaborators," including people I've never even heard of. And then, just hours later, biotech shills began running carefully-prepared press releases which falsely stated that anti-GMO activists were now somehow calling for the killing of GMO scientists. It's blatantly obvious this was all planned in advance: False Flag? It's also very likely that only the most radical branch of the biotech operatives are running this, and other GMO writers or scientists likely have no awareness of the true depth of the subterfuge taking place. There does exist a violent radical branch of the biotech industry, by the way, that plots and carries out all sorts of nefarious activities such as death threats, intimidation tactics, attempted blackmail and much more. 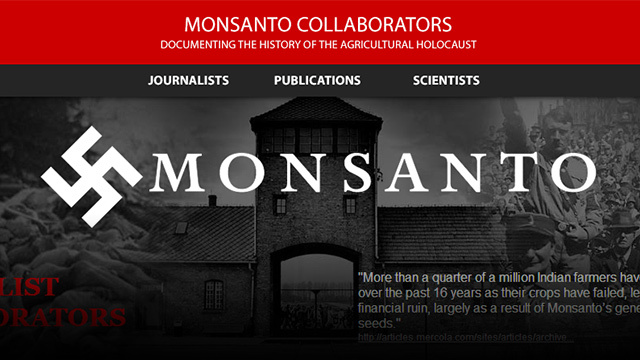 MonsantoCollaborators.org just looks like their latest attempt to sucker everybody in so they can pull the trigger. The very fact that I am publicly calling out this site as a possible trap now places my own life at risk, by the way, and there's no telling how many other false flag attempts they are likely to make in order to carry out their schemes. For this reason, I am recommending that people do NOT link to MonsantoCollaborators.org until more can be determined about its origins and intent. So far, the site is just a list of names and a few articles. There's not really much there. But it's easy to see how this could be part of a bait-and-switch (false flag) tactic to try to discredit the community of GMO skeptics. As far as my own beliefs go, I do think it's a great idea to document the names of all those who are contributing to what may soon because a GMO "holocaust" resulting in widespread death and destruction. The historical record needs to know who promoted it and looked the other way while the "seeds of destruction" were sown. I wholeheartedly agree with the need for historical accuracy on all this as well as the need to charge these collaborators with crimes against humanity once enough evidence has been gathered against them. Everyone deserves their day in court, however, and vigilante justice only leads to chaos. I'm a very strong believer in the rule of law and due process, even for people who have been accused of heinous crimes against humanity that rival those of Nazi collaborators. In fact, in my own article on all this I wrote, "For the record, in no way do I condone vigilante violence against anyone, and I believe every condemned criminal deserves a fair trial and a punishment that fits the crime. Do not misinterpret this article as any sort of call for violence, as I wholly disavow any such actions. I am a person who demands due process under the law for all those accused of crimes."